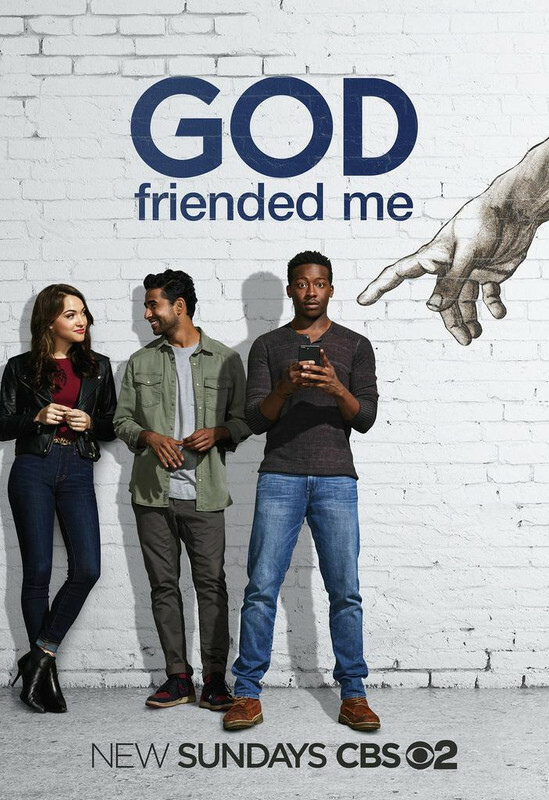 , an outspoken atheist podcaster, finds his life turned upside down when he receives a friend request from "God" on social media and unwittingly becomes an agent of change in the lives and destinies of others around him, on the series premiere of GOD FRIENDED ME, Sunday, Sept. 30 (8:30-9:30 PM, ET/PT) on the CBS Television Network. Violett Beane, Joe Morton, Suraj Sharma and Javicia Leslie also star. Miles is intelligent, hopeful and optimistic, but he doesn't believe in God. This puts him at odds with his father, Reverend Arthur Finer, a beloved preacher at Harlem's Trinity Church for 25 years who is stung by his son's strong rejection of his faith. Miles feels he's found his purpose in life hosting a podcast where he's free to speak his mind, but that changes when he receives the ultimate friend request. After repeated pokes by "God," Miles' curiosity takes over, and he accepts the request and follows the signs to Cara Bloom, an online journalist suffering from writer's block. Brought together by the "God" account, the two find themselves investigating "God's" friend suggestions and inadvertently helping others in need. Joining them on their journey are Miles's supportive sister, Ali, a doctoral psych student by day and bartender by night, and his best friend, Rakesh, a sometime hacker who helps Miles and Cara research the enigmatic account. Miles is set on getting to the bottom of what he believes is an elaborate hoax, but in the meantime he'll play along and, in the process, change his life forever. I loved this. Very charming, has humor and heart. It's very similar to the 1990's show "Early Edition" that CBS also aired. If you watched that show, I think you might like this one. It has a similar premise only with a modern day take on it. The lead was on the cancelled ABC show from last season The Mayor (never watched that), but he was really good here. Very likable. We don't get too many "different" shows these days, but I loved how different this was. It's not your typical CBS drama or a multi-camera comedy. I liked the lead actress in this show Violett Beane. She has a very Emma Stone vibe to her. I didn't post the original trailer. It's almost 6 1/2 minutes long and is filled with spoilers. I only posted a short 1 minute promo to help give you an idea what this is about. Greg Berlanti didn't create this show (he's just an in-name producer), but this is one of the best productions he's done outside of comic book super hero shows. It's a very promising start. The guy who created this series actually was a writer for Gotham. Apparently CBS and WB were very high on this show and that's why they posted the Pilot early. FYI, due to football overrun this is going to start 13 minutes late for East and Central viewers. Pad your DVR or watch on demand. You might still be able to get the episode for free from all the various SVOD providers. Wife and I watched thie pilot a couple of weeks ago through Vudu and actually liked it. One of the dumbest premises I've ever heard. Checked this out based on the recommendation and I liked it! Sounds like something Kirk Cameron would make for GOD TV. I guess this could work if they do it "Quantum Leap" style and never actually reveal the mystery behind "God" because I can't see that ending well at all. I liked it. Kinda like a modern day Joan of Arcadia. I still miss that show. And Jesse Quick is pretty damn gorgeous. Episode 2 was all right. JJ Abrams has been dethroned as the “King of the Lens Flare”....because whoever worked on this episode used it more than any show or movie I’ve ever seen. So distracting. Let me guess - they were trying to be symbolic. Nope, it was just annoying. Tell me a story. Not lens flares. It's kind of a mix between Quantum Leap and Early Edition but not as fun as either of them. Yes! I'm having Early Edition flashbacks every episode! It's not as good as EE, but it's holding my attention. And feels much more contemporary than Touched by an Angel. CBS picks this up for a full season. 20 episodes total. I still like the show despite the endless lens flares. Light hearted drama for Sunday night. More entertaining than Walking Dead! Watched Episode 3 last night. I like how they were trying to find a "Jim Smith" in New York so he ran it through a DMV database and came up with only one match. We’re still watching this, and a couple of episodes actually moved us to tears. We really like the B-plots having to do with Miles’ relationship with his dad. I’m still watching. The chess episode was really good. I am one behind, but this show is a real nice little sleeper show. Enjoy the cast a lot and it's nice to have a lighthearted good natured show on to balance out a lot of the somber dramas out there. I've fallen about 5 episodes behind, but I do really like this show and will eventually catch up. It's a nice "feel good" show. Didn’t realize the April 14th episode was the finale, but it was really good. overall, fantastic season and my favorite new show of the year. Very surprising. Cast has great chemistry. Agreed, this was a very nice show and one I look forward and enjoy every time I watch it, glad it was renewed, it's nice to have this mix of show on the air. Loved the finale, and thought it was really well done. Great season overall and highly recommended for fans of the genre, but the cast is so likeable and the storylines are really nice, great show to catch up on over the summer if you missed it.